Located southwest of Farmington, Titcomb Mountain Ski Area has been serving local and regional skiers for decades. 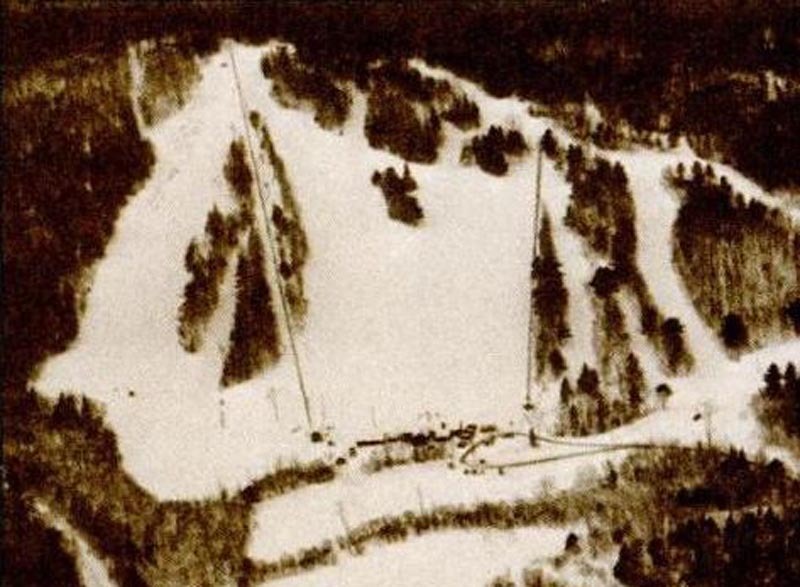 The roots of Titcomb ski area date back to the spring of 1939, when a group of skiers met and commenced work on forming the Franklin Ski and Outing Club. Early outings took place on Voter Hill. The Franklin Ski Club formally filed with the State of Maine as a non-profit in February of 1941. The group eventually selected 712 foot Morrison Hill and started work on a slope. The rope tow served slope likely debuted for the 1941-42 season. On March 1, 1945, ski instructor and racer Captain John Abbott Titcomb was killed in action in the Phillipines. The ski area was named in his honor in 1948, while the base lodge was dedicated in his memory in 1949 (funded by his parents, Mr. and Mrs. Harold Titcomb). After operating for a decade and a half as a rope tow area, the Titcomb Slope expanded, thanks in part to low interest loans provided by the Titcomb family. A 1,300 foot long Pomalift was installed for the 1956-57 season, while a new summit warming hut was also constructed. 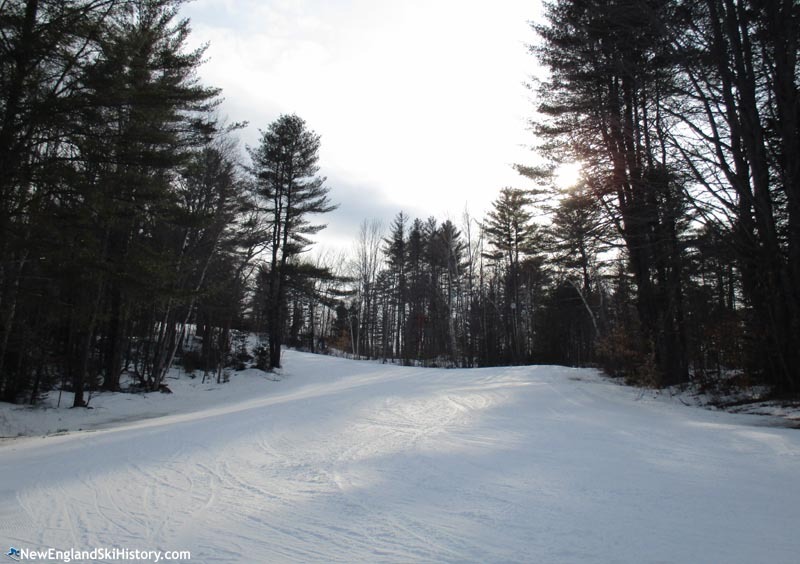 By the time the 1964-65 season commenced, Titcomb Slopes offered day and night skiing, serviced by the Pomalift and a rope tow. The facility featured 4 trails, 40 acres of slopes sometimes compared to those at Cranmore, cross country skiing, and two ski jumps. Most likely in the summer of 1969, the Maine Vocational School helped to convert the Pomalift to a T-Bar, likely using parts from the lift at recently closed Bald Mountain in Oquossuc. The lodge may have also been expanded around this time. A new racing trail was added for the 1971-72 season, coinciding with an expanded racing program. A second T-Bar, from Cannon Mountain, was likely installed for the 1973-74 season. Likely due to poor snowfall, the lift wasn't dedicated until early 1975. The poor 1973-74 season likely also resulted in the installation of snowmaking for the 1974-75 season. Following three consecutive bad seasons to start the 1980s, the Farmington Ski Club found itself in debt due to mounting deficits. A new snowmaking pump helped improve their snowmaking capabilities in 1983, while more fundraisers and cooperative weather helped convert deficits into surplusses by the time the 1984-85 season came to a close. Following a significant fundraising campaign, the base lodge was doubled in size for the 1988-89 season. Three trails may have been added 1993 and 1994, while the snowmaking pond was tripled in size. Night skiing terrain was also expanded. 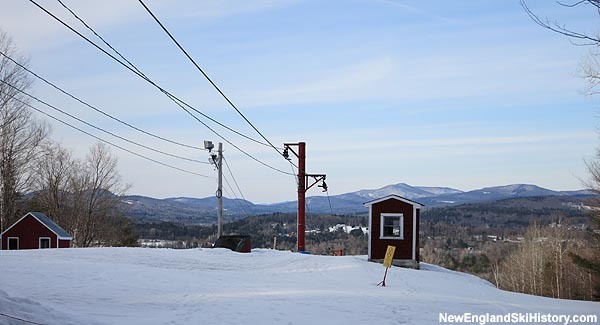 After yet another fundraising campaign, a handle tow lift was purchased from Cranmore and installed at Titcomb for the 2003-2004 season, improving the skiing experience for beginners. Titcomb continues to operate at present, featuring snowmaking and night skiing, as well as plentiful nordic terrain. "Many years of skiing there from 1954 or so until knee injury. Was on Ski Patrol NSPS for many years in late 60s and into mid 70s. Folks volunteered in some fashion, most everyone's parents did. Great place to ski. Miss the pine tree being there!" "I skied Titcomb in the late 40's - mid 50' through high school and through the mid 60's after USA service The jump on n. skis was not that big of a deal!!!! " "I used to ski Titcomb back in the late 60's early 70's with my friends the Griffin boys. I burned out so many pair of gloves on the rope tow. They knew all the woods trails and we really learned to ski well by chasing each other as fast as we couldWE tried the larger wood ski jump one time with downhill skis. We only tried it one time"